By the spring  of 1914, Hawke’s Bay’s first contingent of volunteers were settling in to soldiering life at Awapuni mobilisation camp in Palmerston North. 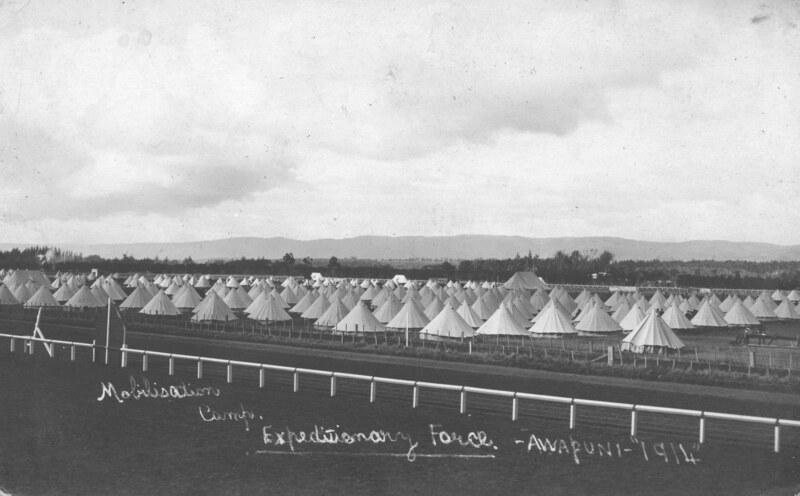 Awapuni was the largest of New Zealand’s four initial mobilisation camps and the muster point for the Wellington Mounted Rifles Regiment, the Wellington Infantry Battalion, the New Zealand Field Artillery, Field and Signal Troops of the NZ Engineers, Company of Divisional Signallers and Mounted Field Ambulance. The transformation of the site from picturesque country racecourse – with stock grazing on the oval, and spring flowers opening on carefully tended flower beds – to one of the busiest spots in New Zealand, took place over a matter of days in mid-August. Hundreds of Territorials and civilian volunteers from Palmerston North and Fielding joined fatigue parties to assist in construction of the camp – doing everything from lay water pipes to pitching tents, all in the abysmal weather typical of early spring. As soon as the camp was complete, thousands of men began to stream in from across the Wellington military district. 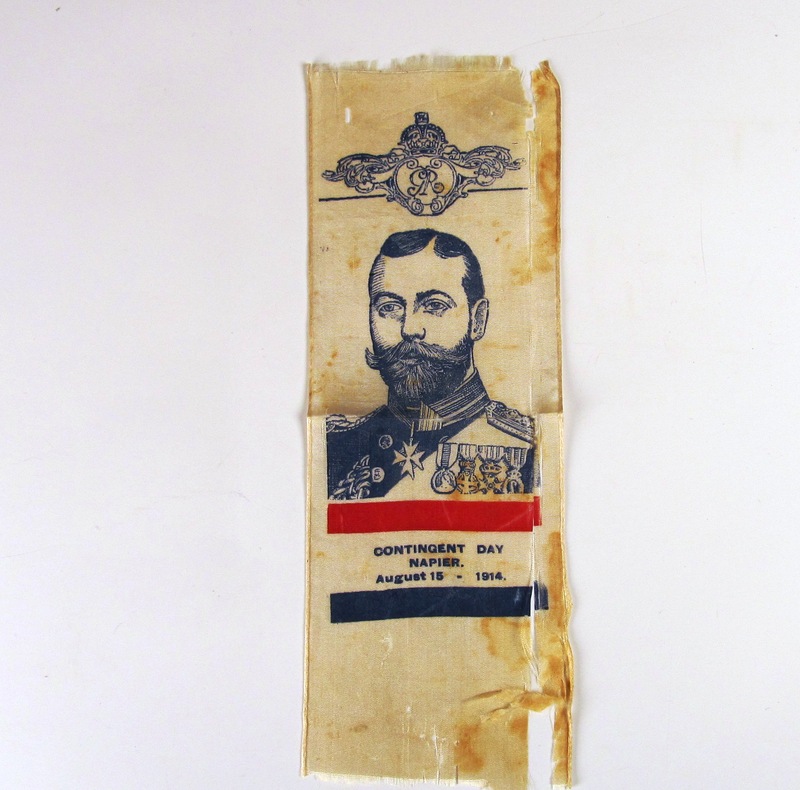 It’s easy enough to understand the fervour of these first volunteers – eager for adventure in defence of the British Empire, buoyed by childhood stories of the South African War and the daily reports of great battles and Allied victories in the papers. After youthful years spent at war games in the Territorials, their chance had come. On arrival at Palmerston North train station, after the journey down the line from Hawke’s Bay, the new recruits were met by a vast steam motor-lorry, owned and driven by Captain Jickell. Men and bags were piled on Jickell’s ‘Dreadnought’ to the upmost limit, “swarming upon it like flies”  (up to 63 men and 23 swags in one load) and transported down to camp, navigating a constant stream of traffic, on what had become one of New Zealand’s busiest thoroughfares. On arrival at camp new recruits would have been greeted by the impressive spectacle of orderly lines of tents, horse lines of patiently tethered horses, and a busy scene of vehicles, artillery, cookhouses, smoking fires, and khaki uniforms of every description. The numbers of men at Awapuni grew over August and early September, until there were well over 2000 men in camp, and over 850 horses. Each bell tent housed eight men, as well as their kit, rifles and equipment. Training commenced at once and largely consisted of physical exercises and route marching, musketry and drill. There was every expectation that the men would have to entrain for Wellington, and sail to Europe within days. The daily route marches, of 12 – 15 miles, in full outfit, were as one trooper put it, “for the benefit of our feet”.’6] A popular route was to Ashurst and back. On one occasion the Wellington Regiment took a route march to Fielding, where they were entertained on arrival at the racecourse, with delicacies provided by the women of the town. Equipping the men for the front was another important activity at the camp. All the military equipment available in New Zealand at the outbreak of war was on issue to the Territorial Force, and while men left for camps as thoroughly equipped as possible by their local Regiment, shortages had to be made up. Public calls were made for all manner of items from saddlery to binoculars. In camp, the YMCA marquee was well attended by soldiers, with supplies of games and reading materials (donated by the public), concerts and religious services. The YMCA also forwarded letters home for the men in training, over 4000 had been sent by the 4 September. Discipline in camp was strict. To encourage good behaviour men were told that on view of the large number of volunteers anyone who committed a breach of discipline would be excluded from the final selection. Examples were made of any volunteers who ignored regulations, even for comparatively minor offences. Among those dismissed were two Napier volunteers (identities as yet undiscovered), absent without leave for two days, who were “bundled off home” on 8 September. At Awapuni underage men were also gradually discovered and returned home from camp. Young men under 20 were not eligible to sign up, and although care was taken, many slipped through the net. Anxious parents up and down the country lobbied the government to ensure the young men were sent home and to improve enlistment procedures, by requiring the production of birth certificates. 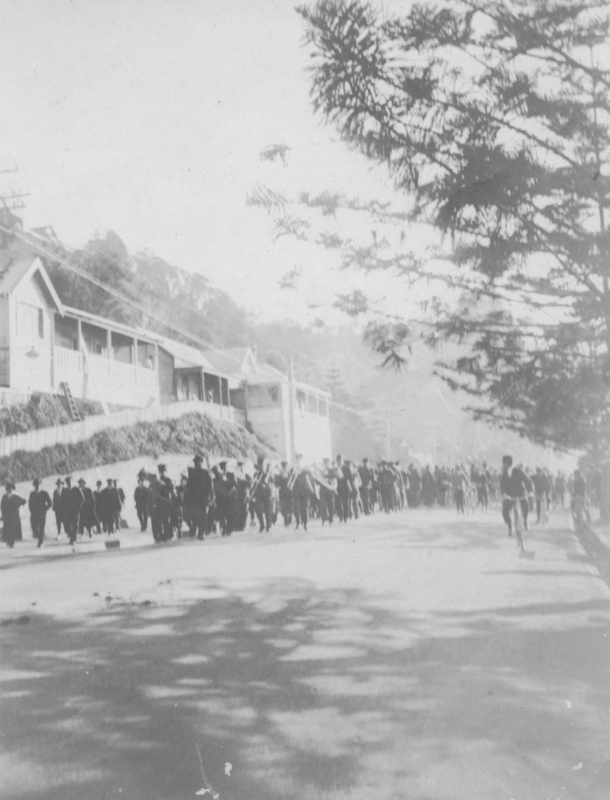 There were a number of opportunities for members of the public to visit Awapuni, and on 23 August the gates were thrown open to the public to inspect the goings-on in camp, and for many to see their husbands, brothers and sons, one last time before their departure. Up to 8000 visitors attended on the open day, and would have included many people from Hawke’s Bay, who would have travelled down for the day. On the 24 August, Major General Sir Alexander Godley, commander of the NZEF, made an inspection of the camp. At 11 o’clock the various units, to a total strength of 81 officers and 2680 other ranks, drew up in front of the grandstand. The squadron was commanded by Major Selwyn Chambers (d. 7 August 1915); 2nd in command was Captain Charles Robert Spragg (and possibly pictured on lead horse), with Lieutenants Norman Donald Cameron (d. 30 May 1915), Percy Tivy Emerson (d. 30 May 1915), Arthur Frederick Batchelar, and 2nd Lieutenant Henry Beresford Maunsell (possibly the four men behind Spragg). Chambers may have taken this photograph. The Gallipoli campaign would destroy the original NZMR Brigade. Half of those who served at Gallipoli died, or were wounded. All would fall sick. For these men, thrown together from across the lower North Island at Awapuni, it was the first step in an increasing circle of identification, comradeship, and rivalry that would take them from their local unit and tie them to their regiment, to the NZEF, the Australian and New Zealand Army Corps and finally to the 8.7 million men  who would serve in the British Army. Of the friendly rivalries which sprang up at Awapuni, one of the keenest was between the infantry and mounted men. One unnamed volunteer reported to his local paper that “the horsemen call the footmen the “toe footry” and smile pityingly as they pass them on the road, while the man with a pack on his back and a rifle on his shoulder calls his mounted friend the “frowsy groom”. Throughout the busy weeks of training at Awapuni, was a current of impatience and anxiety that the war might be over before the New Zealanders had a chance to fight. The fleet of troopships was almost ready but the government was close-lipped about a departure date for the force. Rumours abounded, equipment was packed and unpacked, finally, over the three days of 21st, 22nd and 23rd September the camp was emptied of men, as they left for Wellington by train, on the next stage of the journey. Today, even at a 100 years distance, it isn’t easy to write about these first small steps in New Zealand’s path to war with composure. Knowing what was to come, that by the end of the following year, almost all of these young men of the first contingent would be casualties of the Gallipoli campaign, has lost none of its impact. In my next post I’ll write about the preparation of New Zealand’s fleet of troopships, and activity in Wellington before the eventual departure of the convoy on 15 October 1914. 1 An Awapuni spring joke, as reported in the Evening Post, 26 August 1914. Official War History of the Wellington Mounted Rifles Regiment 1914-1919 by AH Wilkie, 1924. The Silent Division: New Zealanders at the Front, 1914-1919 by OE Burton, 1935. The Wellington Regiment (NZEF) 1914 – 1919 by Cunningham, Treadwell and Hanna, 1928. One hundred years ago this week, Hawke’s Bay’s first contingent of men were mobilised for the New Zealand Expeditionary Force. When the King declared war on behalf of the British Empire on 4 August, New Zealand put its mobilisation plans into action. Men volunteered in their hundreds. Women marshalled in matters of ‘practical patriotism’ – raising funds for the expeditionary force and in equipping men for the front. On 6 August Prime Minister William Massey offered troops for Imperial service and the Defence Force made its first call for volunteers. The government promised to have the entire expeditionary force of 8500 men and 3800 horses on its way to Europe in three weeks. Recruiting began on 8 August. Within a week more than 14,000 volunteers had stepped forward. The Hawke’s Bay men accepted into the first draft departed in groups according to the requirements of the unit they were joining. Whether it was a handful of men, or a hundred, thousands of well-wishers turned out for each departure, and sent them on their way with speeches, brass bands, and a chorus of God Save the King. Some of the first to leave Hawke’s Bay were 37 men who had answered an early call for ambulance brigade members, a machine gun section and railway engineers. A public notice was put up on the evening of the 8th for volunteers; men were selected and fitted out on the 9th, and departed for Wellington on the morning of the 10th. Over 3000 people gave these first volunteers an enthusiastic send-off from the railway stations in Napier and Hastings. 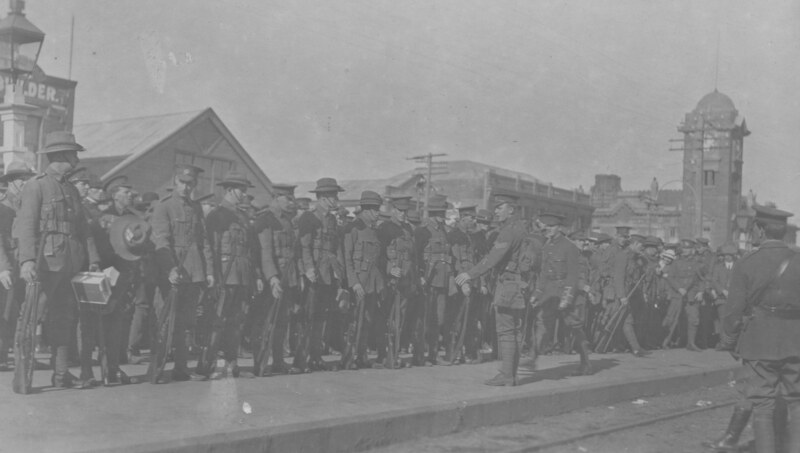 The earliest dated photographs in the museum’s collection capturing the departure of troops from Hawke’s Bay are three photographs taken at Hastings Railway station on 11 August. The Daily Telegraph for 11 August notes the departure of one group of men from Hastings on that day. “Hastings was all agog” the paper said “to see one of the first large groups of men to leave Hastings”, the departure of a draft of 25 Mounted Rifles, B Squadron, 9th (Wellington) and their horses, for Awapuni (via Dannevirke), commanded by Lieutenant [Augustine] Georgetti. 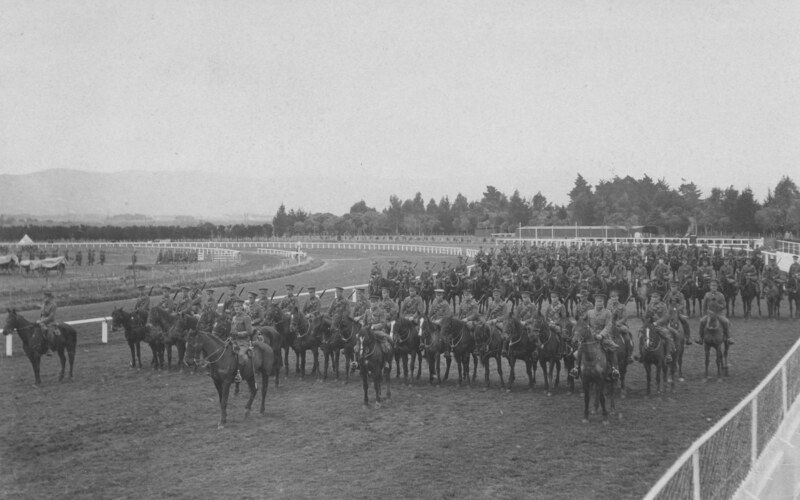 These men were to join the Wellington Mounted Rifles Regiment, formed on 8 August, and which concentrated at Awapuni Racecourse in Palmerston North (alongside other units) from the 12 August. On a meeting at the Napier Council Chambers on 10 August a ‘Contingent Day’, was proposed for the 15 August to raise funds for the expeditionary force. 250 women were given boxes and badges and let loose upon the pockets of the generous Napier public. Some ladies, the paper noted, started solicitations before breakfast, and they worked till 9.30pm that night, canvassing the streets. Hotel-keepers provided complimentary teas to all collectors. At Taradale, the post mistress, Mrs Hazel took charge, and had twenty girls on horseback scouring the countryside. These satin badges, of which the museum has half a dozen, were given out to each patriotic purchaser, for a minimum donation of 5s. By noon, 2000 had been distributed and demands were coming in from collectors for more. Napier Contingent Day raised £351 18s 6d in all. Hawke’s Bay people undertook all manner of concerts, parades and events to raise funds. After the declaration of war, and the confirmation New Zealand would send men to fight, the women of Hawke’s Bay banded together in local Ladies’ Expedition Equipment Committees, to consider how to quickly supply the men of Hawke’s Bay with all they would need for the front. At the suggestion of Lady Godley (wife of General Sir Alexander Godley, Commander of the NZEF) the wives and mothers of the men of the 9th Regiment focused their attention on the supply of vests, hold-alls and ‘housewives’. The various branches of the Girls’ Friendly Society of Hawke’s Bay made and contributed 50 pairs of sox, 50 suits of flannel pyjamas and 50 flannel shirts. Donated goods were collected at drill halls, and citizens were encouraged to make public subscriptions to enable the purchase of materials. Mobilisation commanders directed, and expected that local men be fitted out locally before their transfer to the concentration camps. On 16 August, the main contingent of Napier men assembled in full force at the drill hall to be presented with the war kits that had been assembled by the women of Napier. Lieutenant Colonel Hislop, officer commanding the 9th Regiment (infantry) made a speech of thanks, “on behalf of the Napier boys going to the front I have to most heartily thank the ladies of this town for equipping them”. 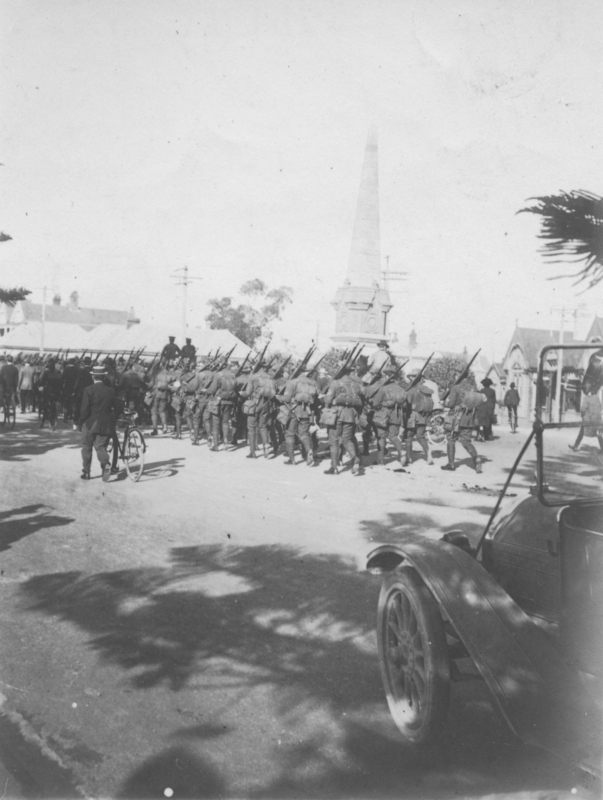 On the morning of Monday 17 August 1914 the main contingent left Hawke’s Bay. From Napier, 112 men, including 33 from Gisborne, met at the Drill Hall, where the the Rev J A Asher, conducted a short service, concluding with the Lord’s Prayer. The volunteers, headed by a band, were then marched to the railway station via the Marine Parade, Hastings, Emerson and Munroe streets, all of which were thronged with spectators. The museum holds two photographs of a large contingent of men parading along Marine Parade, on what may be this occasion. 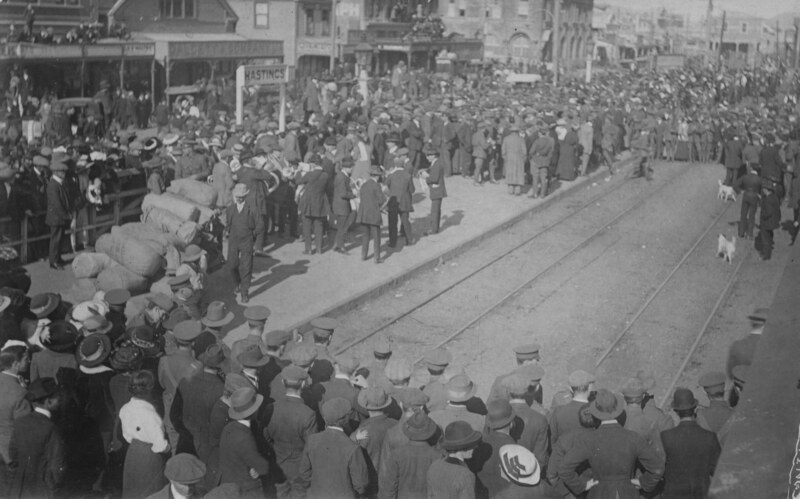 Mayor J Vigor Brown and Lieutenant-Colonel Hislop spoke to the 112 contingenters and a crowd of 7,000 enthusiastic spectators from the balcony of the Terminus Hotel. “A most enthusiastic send-off was given to the local volunteers for active service this morning, many thousands of residents of all ages cheering the men on in their noble response to the great call from the Motherland for some of her stalwart sons. Everyone appeared to be excited and patriotic in the extreme. Flags fluttered everywhere. Ladies wore ties of red, white and blue. Some of the crowd were gathered together in small knots, only too evidently related to some member of the departing warriors, and in such groups were to be seen many saddened faces and moistened eyes. It was a scene of intense enthusiasm, dampened only by the stern realty of what was before the brave lads who had so nobly responded to the call. These scenes of departure were repeated again and again from 1914 to 1918 as reinforcements were mobilised for the front. In my next post I’ll be writing about the next stage of the journey, and the experience of Hawke’s Bay men, at Awapuni, and other camps, as they prepared to depart for the war. Piecing together the story of the departure of the first contingent of Hawke’s Bay men is a challenge, and my research is very much a work in progress. If you have information to share please get in touch. I’m particularly keen to find out if there are any more photographs of the departure of Hawke’s Bay men in 1914 out there? Or better yet, letters, or diaries written by Hawke’s Bay men and women which shed light on daily life and activities in the early months of the war. Did any of your ancestors depart as part of these first contingents of Hawke’s Bay men? A public call was made for items such as strong pocket knives, strong cord, double or single blankets, dubbing for boots, empty pillowslips, underclothing, shirts, socks, towels, soap, brush and comb, shaving material, cleaning material for arms, needles pins and strong thread, forks, spoons, plates and pannikins.